Life is complex, and it’s not getting any simpler. As an adult, you’ve got money going in all directions: car payments, utility bills, loan payments, insurance. It’s almost all you can handle to get all this stuff paid on time. Everybody knows that there are lots of ways to save, to eliminate waste, and to generally optimize these payments. There are plenty of discounts and efficiency strategies out there, but who has the time to do all the research and make a decision? Research shows that once someone selects a financial service, like an insurance provider, they are very unlikely to change again for many years, if at all. It’s because making a determination like that takes time. Not many of us feel emotionally connected to our insurance provider. We’re just too busy to switch. Enter Cinch Financial. This is a great startup who does the work of finding the best financial products for you. And the way they do it is really simple. Let’s take the example of banking. I’ve been with the same bank for years, ever since I was old enough to have my first checking account. It’s a national chain, and it’s fine I guess, but there are problems. For one, there are no branches anywhere near me. Also, I don’t find a lot of their ATMs either. So in the event that I need to sit down with a banker or appear in the flesh at any one of their brick and mortar locations, I’ve got to ride a bus all the way downtown. So I don’t go, and get by using their kind of half-broken mobile app and the occasional phone call. It’s not a perfect situation but I don’t have a lot of time to change, and I don’t know what bank I’d change to anyway. This is where Cinch shines. By typing in my zip code, and a few other pieces of information about how I bank, Cinch can tell me the best bank for me. So I want local branches, good atm access, certain deposit features, and low fees. Citizens Bank, apparently, is the bank for me. I’m X miles from the front door of their closest branch, close enough to ride my bike. And I can actually save $40 a year on fees. Sweet! Without Cinch, I would have to research every bank in my area. It would take an hour. I probably wouldn’t do it at all. Cinch got me this information in less than a minute. It’s important to note that Cinch presents unbiased recommendations based on data, not paid contributions. The bank they recommended to me was actually the best available option. Cinch doesn’t stop with banks. They can analyze lots of different financial products and entities: from credit cards to insurance and mortgage rates, and more. They’ve also got this really cool bit of functionality called “Billsnap”. Basically, you’ll take a quick pic of any recent bill or statement with your smartphone or other mobile device. This is synced up with Cinch immediately, and Cinch finds you discounts or alternative providers. It’s really powerful. Because of local deregulation, there are more than a dozen energy providers in my area. I never knew which one was the cheapest until Cinch was able to do that research for me. What’s great it, Cinch is free to try. So take it for a test drive and find out how you can save on lots of important areas in your life. I love Cinch. It’s aptly named, and is the kind of Web 2.0/mobile finance app that I love. It takes a ton of data and filters it such that it makes a meaningful, actionable change for my life. 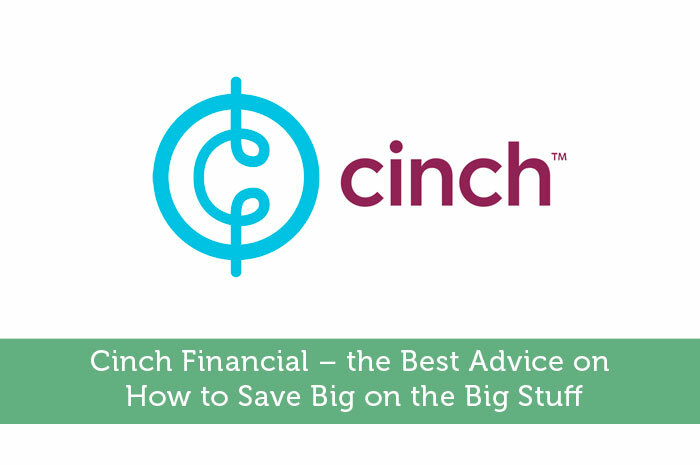 If you love saving money, knowing that the bills you pay are as efficient as possible for you and your life, Cinch Financial is for you. That would be so much easier than doing my own research. I gotta remember this post next time I need the app!